This is the full text of Archbishop William E. Lori's homily from his May 16 installation as the 16th archbishop of Baltimore at the Cathedral of Mary Our Queen in Homeland. A. My thanks to the Cardinals who are with us today and, in a special way, to the Papal Nuncio, Archbishop Carlo Maria Viganò, thank you for representing our Holy Father, Pope Benedict XVI, and please convey to him the sentiments of loving communion of all here today. My greetings and thanks to the many Archbishops and Bishops who join us today, as well as the priests, deacons, religious, and laity of the Archdiocese of Baltimore, and honored guests from the Archdiocese of Washington, the Diocese of Bridgeport, my dear parents as well as family members and friends from Southern Indiana, and many other places, together with interfaith and ecumenical representatives, and those who represent both State and local government, welcome one and all! B. Doesn't this seem like a good day to reflect on what a bishop does? One answer to that question was given by a third grader at the Convent of the Sacred Heart School in Greenwich, Connecticut on the occasion of one of my visits. Asked what a bishop does, she enthusiastically put her hand up and said, "He moves diagonally and protects the king!" ...So now you know! C. Who a bishop is and what he is supposed to be was brought home to me in this magnificent Cathedral of Mary Our Queen some 17 years ago. It was here in this very sanctuary that Cardinal (William H.) Keeler and Cardinal (James A.) Hickey presented me to Pope John Paul II for the first time as a newly ordained bishop. There stood I before John Paul II, an ideal priest and a saintly bishop, whose life spoke more eloquently even than his words about my vocation. And after I had been presented, I sat down and listened intently as that magnificent Pontiff proceeded to describe the unique heritage of this great Archdiocese of Baltimore. This afternoon I want to express the common debt of gratitude we owe to Cardinal Keeler who so loved and fostered the living heritage that is ours, and, I want to join with you also in thanking Cardinal (Edwin F.) O'Brien, who, in challenging times, gave to this Archdiocese of Baltimore the care of a good and loving shepherd! A. We have just heard how St. Paul preached the Gospel in the Areopagus of Athens, the ultimate public square, in the height of the Roman Empire. Paul did not hesitate to bring the Gospel of Jesus Christ into that place where ideas that mattered were discussed and debated. By pointing to the altar to an unknown God Paul sought to make connections between the culture of the Athenians and the Gospel. But never did it occur to St. Paul to present the Gospel as mere ideas, as an alternative philosophy. Rather, in that very public square St. Paul preached Christ crucified and risen as the source of life itself, of meaning, and of salvation. His words were met with skepticism and even ridicule yet among those who heard him, some came to be believe. B. Few people in history went to more Areopagai than did Pope John Paul II as he travelled the length and breadth of the globe proclaiming the Gospel of Christ, as indeed his successor, Pope Benedict, XVI, continues to do. In so doing they are teaching me, they are teaching us all how important it is not only to bring the Gospel into the public square but indeed to defend the right to do so, not only for ourselves but for all believers. Standing in this Cathedral, Blessed Pope John Paul II said: "The challenge facing you, dear friends, is to increase people's awareness of the importance for society of religious freedom; to defend that freedom against those who would take religion out of the public domain and establish secularism as America's official faith. And it is vitally necessary, for the very survival of the American experience, to transmit to the next generation the precious legacy of religious freedom and the convictions which sustain it." C. When the bishops from this Mid-Atlantic region recently visited Pope Benedict XVI, he too spoke forcefully about the need to defend religious liberty in the United States: "With her long tradition of respect for the right relationship between faith and reason, the Church," he said, "has a critical role to play in countering cultural currents, which... seek to promote notions of freedom detached from moral truth..." He went on to say that "the legitimate separation of Church and State cannot be taken to mean that the Church must be silent on certain issues, nor that the State may choose not to engage or be engaged by the voices of committed believers in determining the values which will shape the future of the nation." D. We do not seek to defend religious liberty for partisan or political purposes, as some have suggested. No, we do this because we are lovers of a human dignity that was fashioned and imparted not by the government but by the Creator. We defend religious liberty because we are lovers of every human person, seeing in the face of every man and woman also the face of Christ, who loved us to the very end and who calls on us to love and serve our neighbor with the same love he has bestowed on us. We uphold religious liberty because we seek to continue serving those in need while contributing to the common good in accord with the Church's social teaching and to do so with compassion and effectiveness through Catholic Charities, the largest private provider of human services in the State of Maryland. We do this because Archbishop John Carroll's generation of believers and patriots bequeathed to us a precious legacy that has enabled the Church to worship in freedom, to bear witness to Christ publicly, and to do massive and amazing works of pastoral love, education, and charity in ways that are true to the faith that inspired them in the first place. We defend religious liberty in fidelity to the wisdom of James Cardinal Gibbons who withstood in the breach those who said it wasn't possible to be a practicing Catholic and a loyal American. "...I belong to a country," he said, "where the civil government holds over us the aegis of its protection, without interfering with us in the legitimate exercise of our sublime mission as ministers of the Gospel of Christ. Our country has liberty without license, and authority without despotism." Now we must be loyal Americans by being bold and courageous Catholics! E. So, dear friends, let us be of good cheer. Let us never imagine that the faith we profess with such personal conviction is merely a private matter. By its nature, the profession of faith is a public matter – for the faith is meant to be spread far and wide and acted upon in and through Church institutions and in the witness of individual believers. Let us not shrink from entering the public square to proclaim the Person of Christ, to teach the values that flow from reason and faith, to uphold our right to go about our daily work in accord with our teachings and values, to defend the sanctity of human life from the moment of conception until natural death, to defend the institution of marriage as between a man and a woman, and to serve effectively those in great need with convictions borne of the moral law. A. But, dear friends, St. Paul did not carelessly enter the public square, the Areopagus. Not only did he first carefully study the culture and religious practices of the Athenians, he came filled with the love of God poured into his heart by the Holy Spirit. He knew that the churches where he had preached and fostered the faith needed to be both strong and vibrant, faithful and fruitful, truthful and loving. He knew that for his witness of faith to be believed and for the church to flourish in times of peace as also in times of persecution, that its members must not only stand fast in the truth of the Gospel, but indeed to live the truth in love, to love in accord with the truth we have received. B. Can there be any doubt how challenging this is? The Church is endowed with the holiness of Christ yet in need of constant renewal and purification for those of us who are her members stand in need of God's mercy and the mission of evangelization entrusted to us requires the witness of a blameless conscience. On a day such as this, how hard we should pray that in God's grace, I will be a wise and holy bishop who seeks to model my life and ministry on the Good Shepherd. Pray that, as the Year of Faith announced by Pope Benedict XVI, unfolds, I shall not only teach the faith but bear witness to it in a manner that helps to heal the breach between faith and culture. Pray that, in God's grace, I might foster that unity of faith which makes the Gospel credible, so that together, we may always warmly invite those who have left the Church for whatever reason to return home in joy, in peace, and with hearts open to God's love, ...and together may we continue to invite and welcome those sincerely searching for the truth. C. On a day such as this, how earnestly we should pray for our auxiliary bishops, our priests, our deacons, who serve our parish communities, day in and day out, often bearing extraordinary burdens, for the sake of the Gospel. Dear brother priests, how happy I am that so many of you wrote to share with me your hopes, your dreams, your concerns for this local church you love so deeply. I sense your ardent desire for an ever deeper sense of unity and solidarity, as also your desire that the Church remain a strong and compassionate presence in the City of Baltimore and all parts of the Archdiocese, including Western Maryland. You seek to marshal and shape all its God-given resources for the sake of the Gospel, and for the sake of those we serve or should be serving, including the blessing of a growing presence of Spanish-speaking Catholics in our midst. And because we all so greatly cherish the priesthood to which you'd dedicated your lives, let us never be content to think that God isn't still raising up priestly vocations. "To those of you who think that Christ may be inviting you to follow him in the priesthood or the consecrated life, I make this personal appeal: I ask you to open your hearts generously to him; do not delay your response. the Lord will help you to know his will; he will help you to follow your vocation courageously" (John Paul II, January, 26 1999). D. On this installation day, how I wish to acknowledge and thank women and men in consecrated life who serve so generously, faithfully, and effectively in the Archdiocese of Baltimore. With you, I think of the canonized and beatified religious who have served here, St. Elizabeth Ann Seton, St. John Neumann, Blessed Francis Xavier Seelos, even as we give thanks for Mother Mary Lange whose cause is under way and we remember with gratitude and joy the previous visits of Blessed Mother Teresa. E. On a day such as this how intensely we should pray that the Lord, who willed to be born into a human family, will bless our families, and give us the grace to renew family life in this Archdiocese and beyond. Too often discussions about contemporary life-styles center only on adult feelings and overlook the needs of children and young people. Let us be a church that honors our elders, sustains those in the prime of life, but indeed a church that welcomes our young with enthusiasm and joy and partners with parents in the task of educating and forming the next generation. I thank our parents and educators who, at considerable sacrifice, sustain the mission of our excellent schools in a time of great economic challenge, and who support our religious education programs, our youth programs, as well as adult faith formation, marriage enrichment programs, and so much more. All these exist to sustain you in your beautiful but challenging vocation as married men and women, as fathers and mothers of families who are the bedrock of our society and at the same time the strength of our parishes. 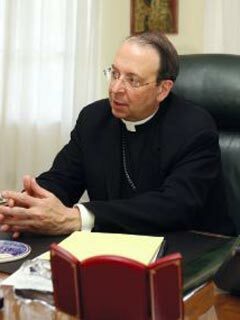 F. How earnestly we must also pray for strong, active, and faithful lay leadership whether in our parishes, boards, offices, or agencies of the Archdiocese – to those of you who, in a spirit of loving service, generously place your talents at the service of the Church's life and mission – I sincerely thank you. Here I think also of the Order of the Holy Sepulcher, the Order of Malta, the Knights of St. Peter Claver and the Knights of St. John, and many other dedicated groups within the Church – yet donning my cap as Supreme Chaplain, allow me to single out the Knights of Columbus for its spirit of charity, unity, fraternity, and patriotism – which is a source of immense strength for the Church locally and universally. Indeed, it was Cardinal Gibbons who ordained the visionary founder of the Knights to the priesthood, Father Michael J. McGivney, for whose canonization we daily pray. G. St. Paul speaks of a variety of roles in the Church but also of their orderly functioning for the health of the whole Body of Christ. As we enter the public square to proclaim the Gospel, to evangelize the culture, to defend human rights and dignity in accord with the Church's social teaching, may our local church be marked by a deep sense of inner solidarity and harmony, by a unity that is born of truth and love forged by prayer, nurtured by the sacraments, and confirmed by keeping the commandments in the spirit of the Beatitudes. By doing so, we prove ourselves to be worthy ecumenical and interfaith partners, both in our search for unity-in-truth and indeed in our service to the common good. By doing so, we also prove ourselves to be worthy partners in serving the needs of all together with government, the business sector, and community groups. A. In today's Gospel, Jesus says to his followers, "I have much more to tell you but you cannot bear it now." Looking out at you right about now, I'd say that just about sums our situation! If God spares me, I'll have 15 years or so to tell you the rest of what I want to say! So I'll leave you with this. This installation takes place practically on the eve of the Ascension. We can almost hear the Risen Lord telling us to gather with the Virgin Mother of God, to watch, wait, and pray for the coming of the Holy Spirit at Pentecost. For it was only with the coming of the Spirit that the Apostles truly grasped the mystery of Christ and truth of the Gospel and found the courage to proclaim the Gospel boldly to the ends of the earth. B. What better way for us to begin this new chapter in the life of the Premier See than to dedicate the days leading up to Pentecost praying that the Holy Spirit might be poured forth upon us in ever greater measure? What better way for us to begin than by begging the Holy Spirit to pour the love of God into our hearts so that we may be formed in Christ, so that we may proclaim Christ by living the truth in love, by embracing love in truth. Through the prayers of Mary, our Queen, may God bless us and keep us always in his love!